Tap: Add one mana of any color to your mana pool. An opponent gains control of Rainbow Vale at end of turn. Thanks for the input NetholonTheArchmage! 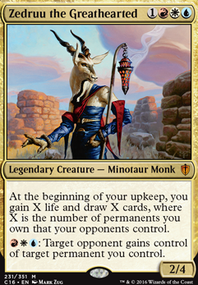 I've been trying to tack more towards low-cost ramp rather than lands since lands become a liability once Zedruu's card draw gets rolling - however, I agree that a few more lands would probably help at the start. Rainbow Vale in particular is a great suggestion since it's actively political and self-donating. Prairie Stream also looks like solid value for the price. The others I'm not sold on since they're a bit slow. I'm still actively tweaking this deck; the description is out-of-date and missing some key info, so once I get a chance to playtest the latest changes I'll be giving it an overhaul. A really nice deck you've put together here. I'm running a similar, politics-based Zedruu-deck aswell ( Zedruu, Enlightened Master), but i fear the budgetlevel is slightly different... so my props to you, for you seemingly have managed to build an absolutely playable budget Zedruu-deck with some very cool and unique strategies :) While you do have a very low CMC, i'd still probably run more lands, something between 35 to 37, as we're playing Jeskai and there aren't to many ways to ramp, so we need to rely on our landdrops... 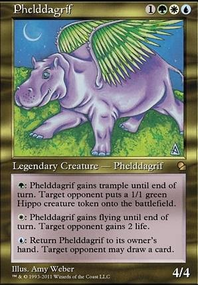 Some budget-additions might be: Nimbus Maze , Prairie Stream , Sejiri Refuge , Wind-Scarred Crag and the other life-lands. I'm also recommending Rainbow Vale as a very political card, that might be usefull by forging alliances... . I have a similar build, but I have some cards you might find interesting. Politics: Mathas, Fiend Seeker encourages reckless play. Xantcha, Sleeper Agent is another way as well, plus it gives a mana sink for the whole table to squander mana. I'm testing Varchild, Betrayer of Kjeldor and Krav, the Unredeemed. Oath of Lieges punishes Green ramp and helps the rest of the table catch up. Vizkopa Guildmage gives you a repeatable combat trick to reward opponents. 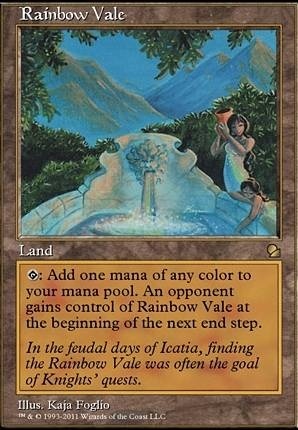 Rainbow Vale is pretty much just like the Humble Defector of land cards. These are some carrots. Teysa, Orzhov Scion gives a repeatable Vindicate and a deterrent to wraths. High Priest of Penance and Slumbering Dragon are two non-deathtouch rattlesnakes that deter attacks. Ayli, Eternal Pilgrim is a repeatable Vindicate, a rattlesnake and lifegain when you want it. Instigator really looks like fun. Finishers: Undercity Informer...no one expects it. Helm of the Host...it may not finish a game outright, but it will do some crazy things. Predator Dragon...feed Drogon your extra token creatures and he'll handle the rest. Yeap, Price of Progress is definitely worth it in EDH if you can build around it! Honestly your deck is dual-colour and there are no really colour-intensive mana costs in your deck, so I think you can actually cut most of your dual colour-producing lands. I would do the following: Cut Cinder Marsh, Foreboding Ruins, Lantern-Lit Graveyard, Rainbow Vale, Rakdos Carnarium. Replace them with basics Mountains and Swamps. This allows you to most effectively abuse Price of Progress. Oh yeah and before I forget you should run Anathemancer. Havoc Festival is a hilarious card! In my experience people rarely try to target it as it hits everyone. Lastly, I recommend that you find some way to squeeze in a few instant speed removal. I think Terminate, Hero's Downfall, Doom Blade, Murder, Chaos Warp are sufficient. You'll want some way to focus your resources against specific players, so that you won't be a "free" target. 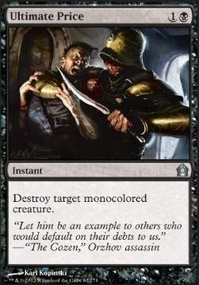 Instant speed removal will never die in your hand, you'll always have something you want to kill/threaten to be able to kill. I would consider cutting Nettling Curse, Custody Battle, Measure of Wickedness, Avarice Amulet, Harmless Offering. If you're looking for cards to add, my first recommendation is to add more lands. Personally, unless I'm running a lower curve, I like to run 35-38 lands, but if you find 32 lands works then here's some other suggestions. 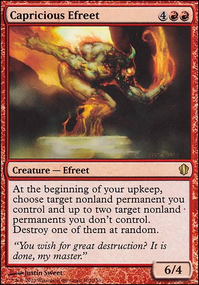 If you want some redundancy with your Propaganda effects you could include Ghostly Prison, Windborn Muse, and/or Norn's Annex. Maze of Ith, Mystifying Maze, and Glacial Chasm are also great ways to protect yourself (and, in the case of Maze of Ith, play a little game of politics). 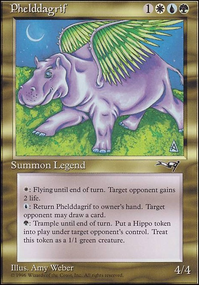 If you want another "help an opponent" card, try Wall of Shards, and Loxodon Peacekeeper will trade around to the player with the lowest life. I don't see any board wipes, so I have to recommend including 1 or 2, some of which include Wrath of God, Merciless Eviction, Cyclonic Rift, Evacuation, and Damnation or Toxic Deluge if your budget permits. Rainbow Vale taps for, well, rainbow, and passes to the player you chose at end of turn. Spectral Searchlight lets you give mana to other players.